The Republican National Convention, like all modern political conventions, is nothing if not a show. The main attraction, GOP presidential nominee Donald J. Trump, is an actual reality TV star. There are over-the-top speakers making over-the-top charges. And, as is the case with most elaborate productions, there are plenty of props. In past years, critics have suggested that is where the convention’s black attendees have come in. Organizers of GOP conventions have been accused of showcasing black delegates, speakers, and even entertainers in ways that exaggerate their presence and importance to the party. If that was true then, it is even truer now. The Republican National Committee did not respond to requests for a definitive count, but an early estimate it shared with The Washington Post said that just 18 – or fewer than 1 percent – of the 2,472 Republican delegates this year are black. That is a sharp decline from its 2004 high point, when 7 percent of the delegates who nominated President George W. Bush were black and he went on to win 11 percent of the black vote in his re-election victory. The miniscule number of black party activists on the floor of the Quicken Loans Arena in Cleveland has only fueled the perception that the GOP is a party of angry white people and Trump is the vehicle for their grievances. That notion frustrates the black delegates and other supporters here, who call that view of their party a distortion, but still sometimes find themselves cringing as they bob in an almost all-white sea of delegates. California delegate Shirley Hussar, right and her fellow delegates cheer during the third day session of the Republican National Convention in Cleveland, Wednesday, July 20, 2016. Blake, a fourth-generation Republican who has run unsuccessfully for local office on several occasions, said she is willing to shrug that off because she likes the GOP’s approach to business and job development. Johnnie Morgan, 65, a convention delegate from Southern California, said he does not like to see pictures of what looks like an all-white convention floor. “Ideally, 50 percent of African-Americans would be Republicans,” he said. Still, he does not feel like a token because he believes even a small black presence makes a big difference. He called being a Republican a reflection of his values. The first time he registered to vote, he asked his parents for advice about which party he should join, he recalled. They told him that Democrats are for poor and black people, and Republicans are for the white and rich. “I wasn’t poor, but I sure wasn’t rich,” Morgan said. “And I sure knew that I was black, so process of elimination made me a Democrat.” But as time went on he learned more about what he saw as Republican principles: self-sufficiency, capitalism, low taxes, God and country, law and order. 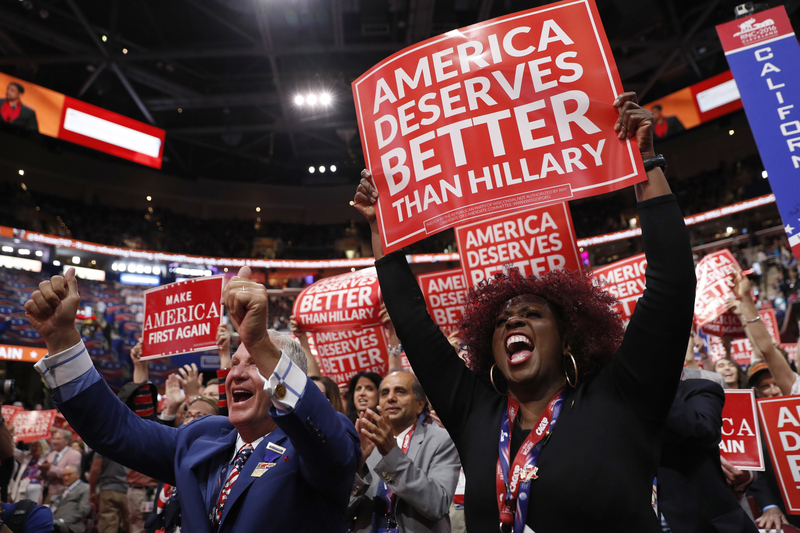 Nonetheless, some black Republican activists say they would get more respect in their communities if they were a more significant presence at the national convention. 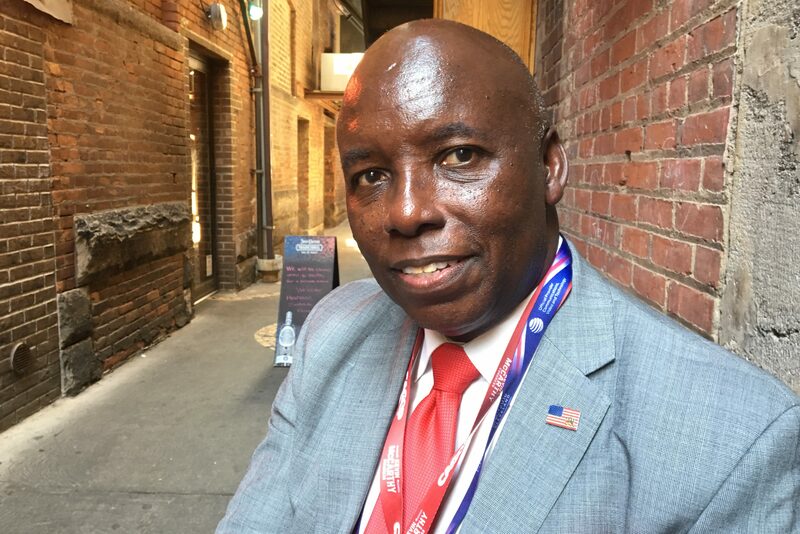 Raynard Jackson, a longtime Republican operative who served as a delegate to the 1988 GOP convention, called the small number of black delegates in Cleveland an embarrassment. The tiny number of black delegates at the convention hasn’t excluded African-Americans from being part of the show. They have been featured making some of the most biting remarks in the convention’s televised prime-time speeches. On Tuesday night, retired neurosurgeon Ben Carson drew a line from Hillary Clinton to Lucifer. Milwaukee County sheriff David Clarke Jr., a registered Democrat who has blamed the Black Lives Matter movement for inspiring deadly ambushes on police in Dallas and Baton Rouge, Louisiana, brought the crowd to its feet Monday night when he declared “Blue. Lives. Matter.” The same night, Jamiel Shaw, the heartbroken father of a 17-year-old Los Angeles high school football player killed in 2008 by a gang member who was an undocumented immigrant, made a fiery call for a crackdown on illegal immigration. With that, the overwhelmingly white crowd inside the arena roared its approval.